If Gen. John Allen is leaving Afghanistan, what’s next? 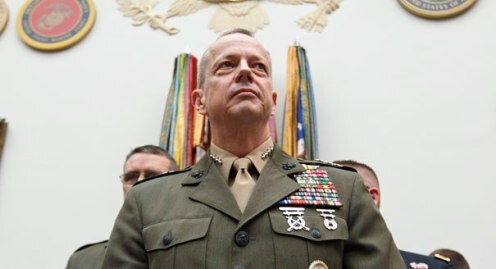 You are at:Home»Afghanistan»If Gen. John Allen is leaving Afghanistan, what’s next? Gen. John Allen is reportedly in line to become the chief allied commander in Europe in 2013. The Washington Post ran a long-form story on Gen. John Allen on Sunday, highlighting his efforts as a “triage commander” while leading the war in Afghanistan. The general has a “pragmatic focus,” the piece said. He’s “more professor and Southern gentleman than hard-bitten Marine general,” and closely studying the Russian withdrawal from Afghanistan in 1989 during a complicated withdrawal of 23,000 U.S. troops there this summer. Yesterday, we got a striking revelation about that same general: The supposedly indispensable leader of the war in Afghanistan is in line to become top commander of U.S. European Command, according to another story in the Post. He could leave his post in Afghanistan as soon as next winter, in between fighting seasons. How those two realities square with one another seems like a fair conversation to have. On one hand, there’s obvious reason for concern. “Another Afghanistan Commander Bails on the War Early,” reads a headline on Wired magazine’s popular Danger Room blog, and that’s a point of view that will certainly be held by many. On the other hand, it’d be fascinating to know what’s going on behind the scenes at the White House and in Kabul that spurred this conversation. Did Obama and Allen reach some sort of deal? Did Allen ask to move on? If so, why would the president agree to it when most educated observers believe the war in Afghanistan already has had far too many transitions in leadership in the last few years? This one will bear watching in coming weeks. Lt. Gen. Allen certainly is a man with deep military rooths, well educated, a front runner in military experience and man who is well able to engage his superiors and his soldiers. He is a man who needs new chaleanges. Which energizes his soul. He has new goals and new dreams. He will perform his next assignment as well or may be even better then his last. Iemelda I. SUZUKI I am proud of you of being the top commander of usmarines. Your the on ly man. That. Prevent the. Peace and good willtoman kind. I hope these is the good sample being the leader of the us marine.